Reliable, innovative planters. Proven for decades. Technology Made Simple. Technology Made Better. Single Auger. Dual Auger. Superior grain handling capabilities. Dependable when crops are ready. Hybrid horizontal tillage tool to give you more acres per hour, more productivity, more efficiency and more profit. Current Kinze owners, you’ve come to the right place. 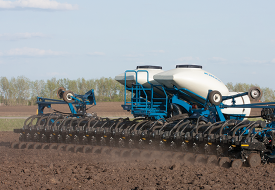 Find equipment manuals, planter part information, retrofit kits, and more. Meet our leaders. Discover our core values. Read real reviews from real people. We’re a family business with family values. And we live them. Enjoy learning about Kinze in this section. 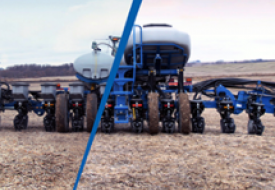 Williamsburg, Iowa (Jan. 31, 2018) – Kinze Manufacturing, an industry leader in planter and grain cart equipment, is expanding its offerings with the addition of four high-speed disc tillage models, Mach Till 201, 261, 331 and 401. 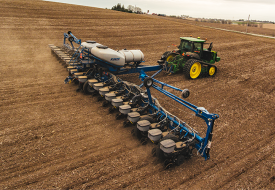 Susanne Veatch, Kinze president and chief marketing officer, said the new Mach Till high-speed disc products support farmer interest in faster tillage that enables them to stay ahead of the planter and be more productive by covering more acres in less time. “Farmers will now be able to obtain three types of equipment from their Kinze dealer, all with the same standard of quality,” she said. The new product line is based on a Canadian design, produced by Degelman Industries, that has been licensed to Kinze to build at its manufacturing facility in Williamsburg, Iowa. Kinze will exhibit one of its first tillage models – the Mach Till 331 – at the 2018 National Farm Machinery Show Feb. 14-17 in Louisville, Kentucky. 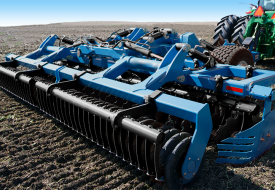 In addition to high speed (8-12 mph) and high capacity, the versatile Mach Till lineup also offers simple setup and ease of use, maintenance-free parts and the ability to perform in various soil types, from fall primary tillage and residue management to spring secondary tillage and seedbed preparation. The product is built heavy for high speed and deep working depth, but provides great flotation for lighter seedbed preparation that minimizes soil compaction. Veatch said the tillage products will be available from Kinze dealers in the United States and Canada, as well as for export to customers in Eastern Europe and Russia. Pricing information will be released this spring, with product availability beginning in fall 2018. For additional information, farmers can visit Kinze at the 2018 National Farm Machinery Show – North Wing, Booth 4499. Founded 52 years ago on the premise of innovation, Kinze Manufacturing, Inc., markets its planters and grain carts globally and is known for a number of industry “firsts.” Kinze operates with core values of integrity, customer focus, excellence, innovation and mutual respect. 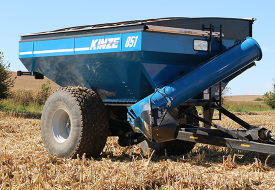 Kinze Manufacturing is the recognized technology leader and innovator of planters for row-crop production and grain auger carts, and in 2018 is expanding its product offerings with high-speed tillage equipment. Kinze employees spend their nights and weekends farming, putting them in a unique position to be both manufacturers and customers of the planters and grain carts they build. © Copyright 2018 by Kinze Manufacturing, Inc. All rights reserved. Kinze® and the Kinze™ logo are trademarks owned by Kinze Manufacturing, Inc. Kinze Manufacturing, Inc. reserves the right to make changes in engineering, design and specifications, or add improvements at any time without notice or obligation. Sign up to receive the latest news on Kinze products and innovation.